When I first visited Sutcliffe Park in 1992 it was a paradigm of dullness in parks, unless, like me, you were looking for a good example of an inter-war park designed to get a supply of fit young men in case there was another World War. This, in fact, is why I took the 1992 photograph. 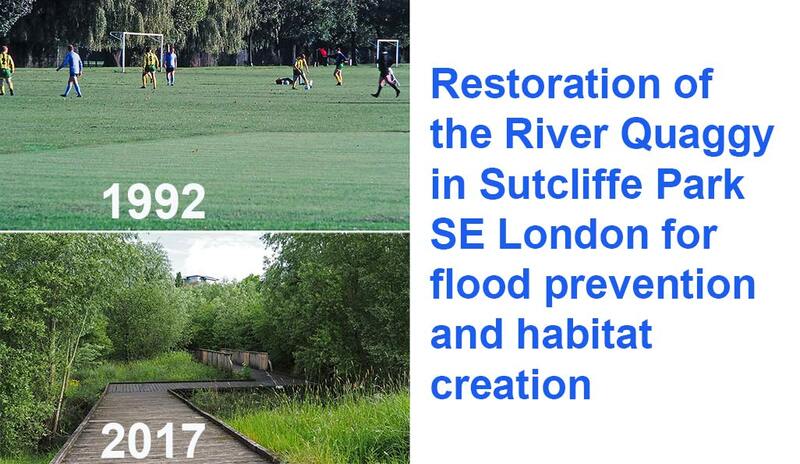 Today, Sutcliffe is a paradigm of how landscape architects can reclaim engineered rivers and protect cities from floods, beautifully, sustainably and economically. This is why I went to photograph Sutcliffe Park in 2017. The Quaggy River was restored to its historic course for reasons of flood detention, infiltration and habitat creation. This has changed a flat expanse of football pitches into a beautiful example of nature in cities. The design was by landscape architects and engineers working for the Environment Agency EA (formerly the National Rivers Authority NRA). The first design was by NRA landscape architect Kevin Patrick. He was very disappointed when LB Greenwich refused to let the scheme go ahead and went into private practice. Later, a modified scheme was implemented by landscape architects working for the Environment Agency. Congratulations to them. But the scheme would never have seen the light of day without a political campaign run by the Quaggy Waterways Action Group (QWAG) as described in the below video. The Environment Agency now uses the restoration of River Quaggy as an example of its enlightened approach to flood management. See Solving London’s urban flood problem – a landscape architecture approach. Sutcliffe Park is in the London Borough of Greenwich. ‹ London National Park City? or Green Grid? or Landscape Strategy?